You have in your hands a unique book, a book "bomb." In his three-year work on it, the author used a supercomputer and the vast experience of one of the creators of the variant, and in the theoretical section of the book he cites more than two thousand new products! In addition, the famous grandmaster and coach, who was a part of the famous team of Kasparov at the time of matches with Karpov, managed to look extremely hard at the "basic" book of E.Sveshnikov about the Chelyabinsk variant. 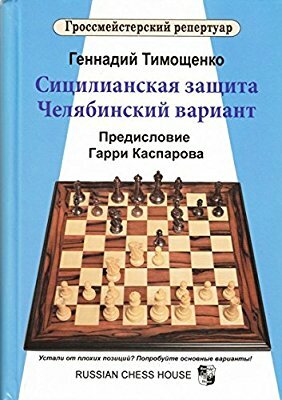 "The book of Grandmaster G. Tymoshenko on the Chelyabinsk version of the Sicilian defense, in my opinion, is both very interesting and necessary. There is a lot of work behind it, and this is evident when reading, especially when re-checking the analyzes, "Garry Kasparov wrote in the foreword. "Grandmaster's repertoire" - a new series of high-quality books written by leading chess players and coaches of the world. Based on the main theoretical options, they offer a full repertoire, which will last for many years, both professionally and amateur, with faith and truth. • The most important options with the expert's explanations • Hundreds of debut novelties • The refutation of many theoretical options • The debut repertoire for life. Increased format (170x235 mm).